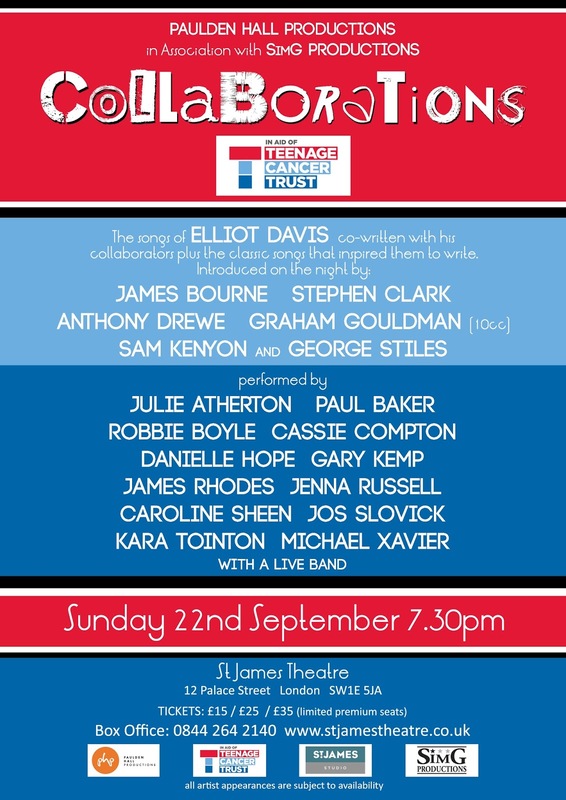 Paulden Hall Productions and SimG Prductions are presenting Collaborations at as part of the St. James Theatre Studio Cabaret Weekends on Sunday 22nd September (4:00pm and 7:30pm shows) in aid of the Teenage Cancer Trust. The theme of Collaborations is the songs of musical theatre composer Elliot Davis written with Anthony Drewe, George Stiles, Graham Gouldman (10cc), Stephen Clark and James Bourne (Busted). Elliott Davis was nominated for an Olivier Award for best musical for Loserville with his other musicals including Soho Cinders, Out There, Best Friends and Butterflies. His collaborators performing the songs are West End stars including Julie Atherton, Paul Baker, James Bourne,Robbie Boyle, Cassie Compton, Danielle Hope, Gary Kemp, James Rhodes, Jenna Russell, Caroline Sheen, Joss Slovick, Kara Tointon and Michael Xavier. Songwriters including James Bourne, Anthony Drewe and Graham Gouldman will also be there to introduce their songs.